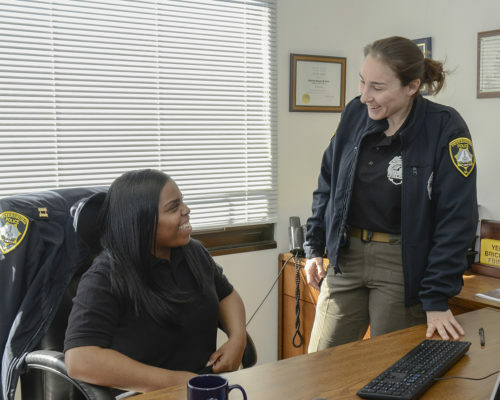 Working in law enforcement is in Angela Lyons’ blood, and she found her path to a career in it at Richard Bland College of William & Mary. 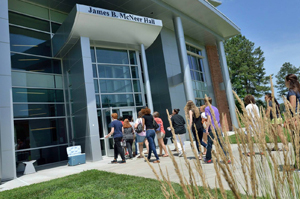 As a high school senior, the Chester native had four acceptance letters from colleges throughout Virginia but was still not certain where she wanted to go. Speaking with family friends who had attended RBC prompted her to take a closer look at the school practically in her own backyard. A childhood dream came true thanks to a relationship Lyons also formed with the nightshift security officer at the dorm where she was a Resident Assistant. In the summer of 2018, Officer Mark Williams connected Lyons with internship opportunities at both the Petersburg and Richmond Police Departments. Now a forensic science major at RBC, Lyons appreciates the support she receives from the campus community and the classes available. Through the guaranteed transfer program, Lyons will attend VCU after graduating from RBC in May 2019. She will carry her experiences as a Student Ambassador and a member of the Student Conduct Board with her as she continues her collegiate journey. “I am really happy I started out at RBC,” she says.